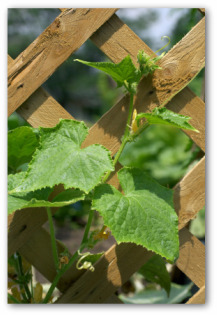 Learn how to use a cucumber trellis to grow great cucumber plants in your vegetable garden! Additional helpful tips and information for planting, growing and caring for cucumber plants are given below. Whether you are setting out a traditional vegetable plot or planting a container garden, providing a trellis for vigorous growing cucumbers is a good idea. Use trellises to keep vines off the ground so there will be good air circulation and fruits will ripen away from the soil. These sound vegetable gardening practices are the best defenses against plant diseases. In ancient Rome, Roman gardens used the garden trellis design much like we do. The Romans designed trellises to support plants and separate garden areas. A trellis is an easy and practical way to make the most use out of a limited gardening area. A trellis may be affixed to a garden wall or left free-standing. It helps provide support, saves space, and adds style and serenity to the garden surroundings. There are many different types of materials that can be used to construct the supports such as a wood, fence panels, wire cages, rope or twine, or a ready-made steel trellis can be used for supporting robust growing vines efficiently. 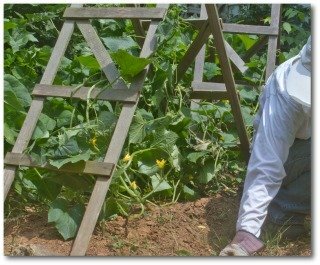 A favorite vegetable gardening method for growing cucumbers is training the plants to grow on a trellis. This is a very rewarding technique that will supply you with with a bountiful harvest of fresh cucumbers for pickling and eating. 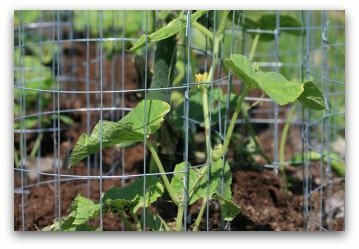 Use the following guidelines for designing a cucumber trellis. You can start cucumber seeds indoors 8 weeks before the last expected frost. Alternatively, you can buy healthy looking plants with dark green leaves and thick stems from your local garden center. Growing cucumbers from seeds is rewarding but a bit more time consuming. It is sometimes easier to start cucumbers from seed than it is to transplant the delicate cucumber seedlings! Most cucumber varieties will climb. 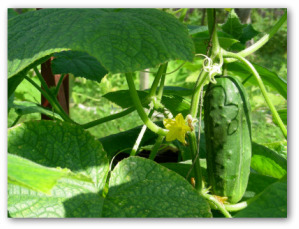 Growing cucumbers on a trellis provides more fruit per plant than the plants grown in a garden bed. Erecting a sturdy wooden or wire-cage trellis can help support the fairly heavy vegetables. As your seedlings grow, build up the soil below the trellis until it is loose and mounded. A raised bed permits proper drainage to provide a well drained garden bed. Incorporate vegetable fertilizer and peat moss into the soil. 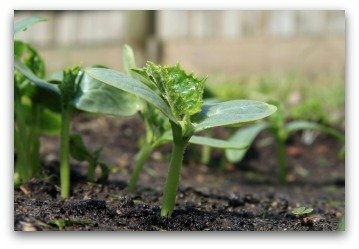 When soil and the weather have warmed sufficiently, plant your seedlings or young plants in the garden. It is fine to crowd the plantings somewhat because the plants will be trained to grow upward onto the trellis instead of sprawling outward. The seedlings will soon grow feeder vines. 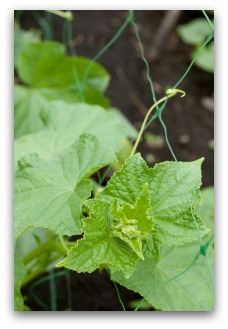 As the plants become taller, work the feeder vines in and out of the cucumber trellis if needed. As the vines begin climbing, encourage the growth in the desired direction. Training establishes a well-covered trellis and adds support for future produce. Weeding is very important to the production of a plentiful harvest. 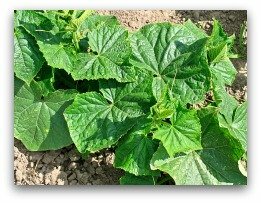 You do not want the cucumbers to have to compete with an out of control weed population for essential nutrition. Water the cucumber plants regularly. This is the key to producing sweet, juicy cucumbers! Bitter cucumbers usually means the plants have not had enough water! A cucumber has both male and female flowers. To aid the fertilization process, if you don't see many insects working your plants, use a tiny paint brush and simply take pollen from the male flower and dust it onto the female bloom. This action is designed to give Mother Nature a helping hand in producing a hearty cucumber crop. 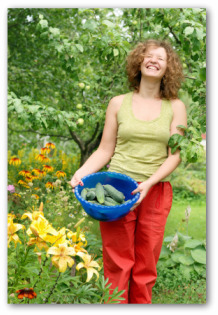 A cucumber trellis is not only functional but enhances the beauty of your vegetable garden. A large section of blank wall can be easily transformed into an attractive focal point with the addition of a decorative trellis. A trellis can be made of diagonal, horizontal, or vertical bars to screen an unsavory garden area from view such as a compost pile, pump house, gas containers, or garbage cans.